Hudson RCI 380-88R Concha Therm III Plus Dual-Heated Servo-Controlled Heater . New Life Scientific, Inc. The CONCHATHERM III® heated humidifier is part of a complete system, designed to heat and humidify respiratory gases delivered to adult, pediatric, and neonatal patients. The CONCHATHERM III can be used with ventilators, continuous flow systems, oxygen diluters and blenders, adjustable nebulizer adaptors for aerosol therapy, or nonflammable anesthesia gases to help maintain patient body temperature. 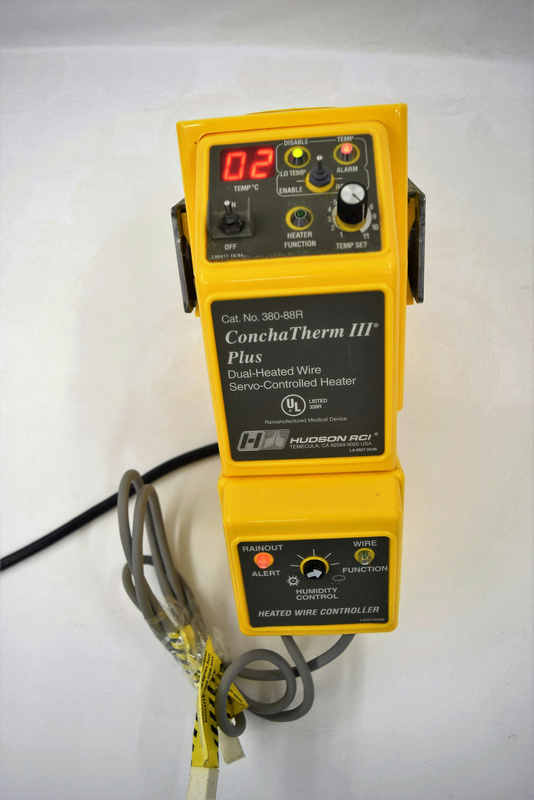 The CONCHATHERM III is intended for use with the following Hudson RCI humidification system components: CONCHA® water reservoirs, CONCHA-COLUMN® humidifier cartridges, and CONCHATHERM single temperature probes. NLS technicians tested, they do power up and the alarm works.